While some may have taken offense that the Prime Minister had publicised issues relating to attacks against Australian Government agencies, there is a difference between calling out agencies with their specific vulnerabilities and undertaking vulnerability research. For example, if the PM had stated: “The Department of Energy, primary nuclear reactors are vulnerable at the Siemens PLC controllers for this new attack that can be launched by attacking this vector (without disclosing to Siemens the vulnerability and giving them time to patch and announce), that could be interpreted as irresponsible. A recent example in support of this is United Airlines. After some speculation that Airlines were at risk in the US, there was at first a knee jerk reaction that ‘any’ findings were considered criminal but after some time, airlines opened up to crowd sourcing and now offer bug bounties. Cyber-attacks became a way of life for nearly every organization in 2016. It is Radware’s view this trend will continue in 2017. Almost all ransom events have a different attack vector, technique or angle. There are hundreds of encrypting malware types, many of which were developed and discovered this year as part of the hype. Also, DDoS for ransom groups are professionals who leverage a set of network and application attacks to demonstrate their intentions and power. Most companies or government agencies have not come up with a precise calculation of the losses associated with a cyber-attack. Those who have quantified the losses estimate the damage at nearly double the amount compared to those who estimate. Common IT devices, including firewalls, application delivery controllers and intrusion protection systems, now represent the greatest risk for an outage. Consequently, they require a dedicated attack- mitigation solution to protect them. Although 39% report suffering an SSL-based attack, only 25% confidently state they can mitigate it. Data leakage and service level impact often come together, with a DDoS attack serving as a smoke screen that distracts IT teams so data can be infiltrated. Burst attacks are increasing thanks to their effectiveness against most mitigation solutions. As the first IoT open-source botnet, Mirai is changing the rules of real-time mitigation and making security automation a must. It isn’t just that IoT botnets can facilitate sophisticated L7 attack launches in high volumes. The fact that Mirai is open-source code means hackers can potentially mutate and customize it— resulting in an untold variety of new attack tools that can be detected only through intelligent automation. 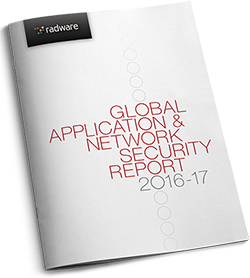 Radware’s 2016-2017 Global Application & Network Security Report findings are from a 2016 security industry survey; reflect Radware’s Emergency Response Team’s (ERT) “in-the- trenches” experiences fighting cyber-attacks and incorporates perspectives of third-party service providers. This research provides a comprehensive and objective review of 2016 cyber-attacks from both a business and a technical perspective. It also offers best practices for organizations to consider when planning for cyber-attack protection in 2017.
experience cyber-attacks. The Ring of Fire reflects five risk levels. As sectors move closer to the red center, such organizations are more likely to experience denial-of-service and other cyber-related attacks at a higher frequency than the others. There have been changes to the Ring of Fire since last year. Telecom, government institutions and gaming companies stay at the center of likelihood while the financial services industry has moved toward the center. Retail, education and healthcare industries remain stable, but technology companies are actually moving away from the center. Energy and utility companies remain in the low risk level due to tighter security. This post has previously appeared in Australia Security Magazine. Gavin has over thirty years of law enforcement and intelligence experience in Australia at the state, national and international level. He has a wealth of subject matter expertise in cyber security, investigations, intelligence, physical and information security and mission critical IT solutions specific to the law enforcement, intelligence and security communities. He has been recognized and received a number of awards for his contributions to law enforcement in both Australia and internationally including a Certificate of Recognition from the United States Justice Department Federal Bureau of Investigation (FBI) and a Certificate of Appreciation from the California Department of Justice, Los Angeles Police Department and Los Angeles County Sheriff's Department. Gavin is responsible for Radware’s Australian Federal Government territory. 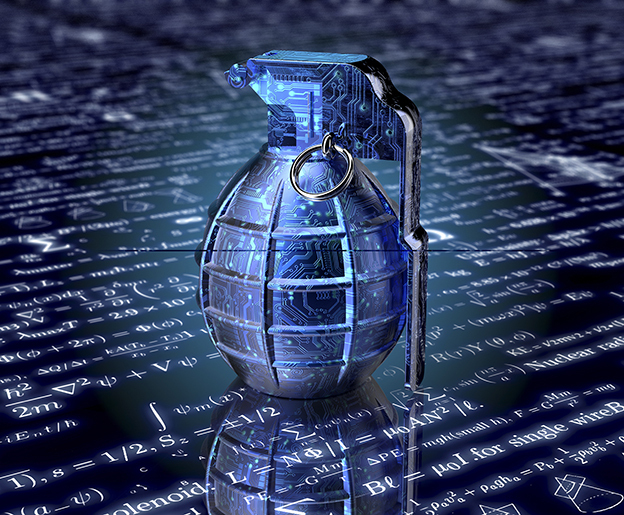 Next PostWAF and DDoS – Perfect Bedfellows: Every Business Owner Must Read.